We're now down to the last 20 (all unsigned) copies out of the first edition of 1,000. 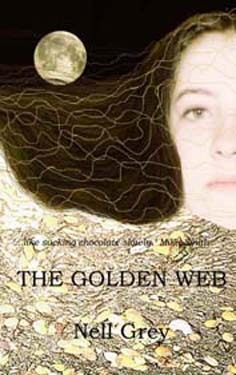 Collectors, please go to The Golden Web Collectors' Edition for details of the limited edition in hardcover. Nell Grey was brought up in the South of England. Her dream from an early age was to become an artist and writer, and having spent most of her life achieving the first objective, exhibiting with The Society of Women Artists, The National Acrylic Painters Association and other societies, published her first novel, Solitary Pleasures, in 2003. She lives in Sussex, and has recently completed Three Magic Women, both prequel and sequel to The Golden Web. ‘ 'This is a marvellous novel. The prose reads like a blending of the best of Joanne Harris and Anita Diamant, with a magic twist of its own. The main character, named Ellie (though her real name is only uncovered later in the book) is a deep and complex creation who quickly draws the reader into her world and takes us with her on her exciting and revelatory journey. The powerful ending is both shocking and perfectly right.